One of our favorite Italian flavored meals is Fettuccine Alfredo. We absolutely LOVE it. The taste, the texture, the comfort. We’re talking about a plate of extraordinary deliciousness dished and ready to serve up for dinner. This version is made in an Instant Pot, so it’s a one pot meal that takes the hassle out of making dinner. We’ve made a few different recipes with Alfredo sauce, and they are all good. They are all a little bit different, but they are all great to serve up to just the family or a group of guests. We especially enjoyed this Copycat Crab Alfredo we made not too long ago, which uses a little bit of a lighter Alfredo sauce. It calls for half and half instead of heavy whipping cream for a lower calorie alternative. We’re all about taste-testing copycat recipes. And any of these recipes would be phenomenal as starters and side dishes to serve with our Instant Pot Chicken Alfredo. We’ve got a delicious Copycat Zuppa Toscana Soup Recipe that is a delicious appetizer. And you can’t go wrong serving up either Copycat Rosemary Macaroni Grill or Copycat Breadsticks alongside your main dish. When it comes to pasta, this is seriously one of our favorite recipes. Cooking is meant to be fun, but its also good when you can find ways to reduce your time in the kitchen because as much as we’d like to think otherwise…there isn’t always all that much time to spend cooking. Busy weeknights get even busier when the school year starts back up each year. And that means less and less time for cooking meals that you and your family will enjoy. We’ve really been enjoying our instant pot because it offers a time savings in the kitchen. It also allows people to cook with more whole food ingredients without taking hours and hours to make a meal. That is something we can all get behind. Dinner time is something that is meant to be enjoyed around the kitchen or dining room table. When you’re super busy during the week, with after school activities and the like, it’s helpful if not essential to try to cut down on actual dinner prep time in order to spend valuable time with your family. And, don’t forget to cherish that time with your family when you can because kids grow up way to fast and before you know it everyone in the family is going in different directions. Whether you’re a family with young children, have teenagers or are empty-nesters, having a sit down meal at least once a week is a recipe for success every single time. It’s not always easy to do, but putting in the extra effort is really worth it. For this recipe, you’ll want to have a stainless steel inner pot for your instant pot. We like having a spare inner pot on hand so we can make back to back recipes. For example, some days we make dinner and then decide to boil eggs in the instant pot right afterwards so we have eggs ready to go for breakfast or lunch. Making things ahead of time is always a time saver when you’re in a crunch. 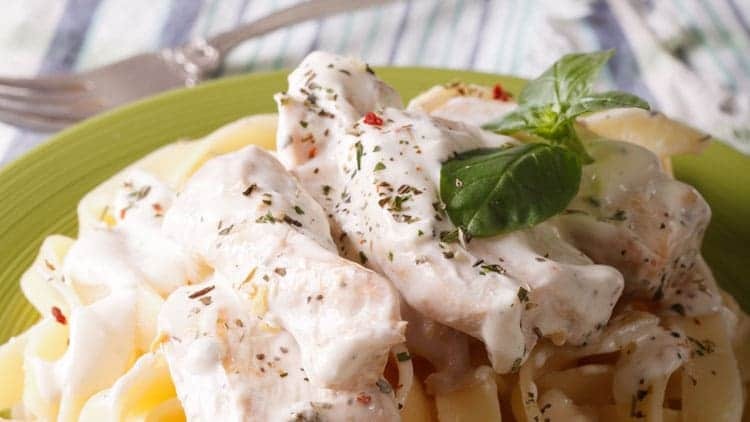 After a plateful of this delicious Chicken Alfredo Pasta, you’ll want to save a little bit of room for dessert. We can’t get enough of Hazelnut Cheesecake Layered Icebox Cake, if you’re looking for a recipe to serve up for dessert. We also really enjoy our Banana Cream Dessert. Both of these are excellent choices for a tasty dessert idea. Easy Instant Pot Chicken Alfredo. 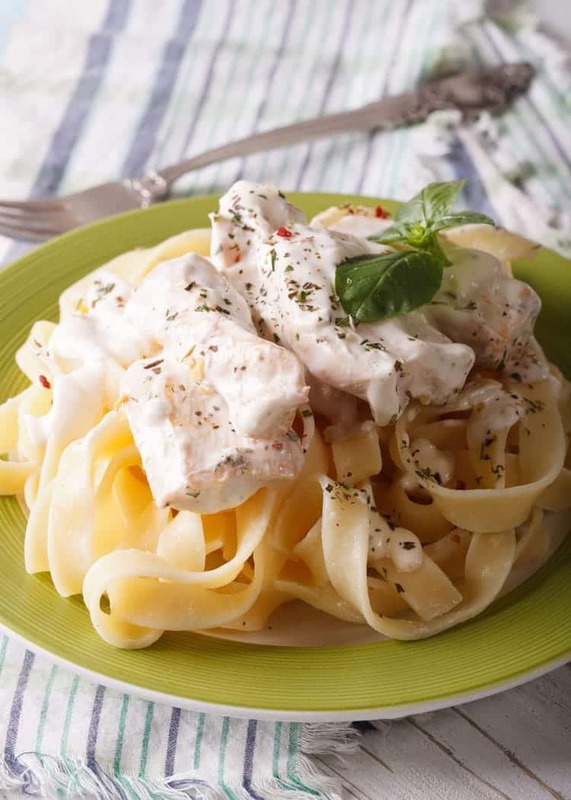 This is an simple way to make chicken Alfredo with delicious results. 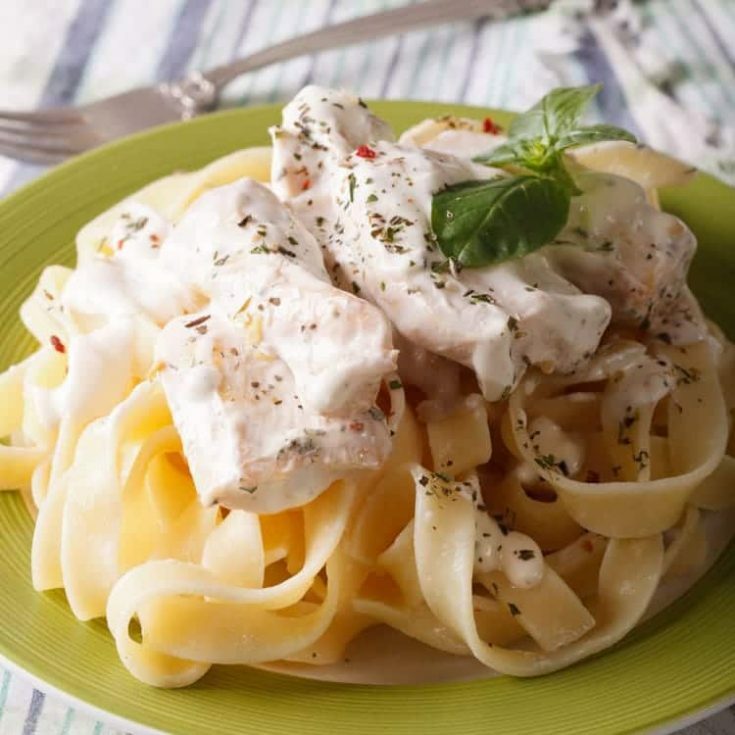 We love the taste of this Instant Pot Alfredo Sauce. Put ¾ cup water into pot with steamer rack. Set to sauté to bring the water to a boil. While waiting for water to boil, sprinkle Italian seasoning over both sides of chicken breast. Place chicken on rack. It’s ok to stack the chicken pieces on top of each other. In the inner pot, place macaroni. Add olive oil and just enough water to cover pasta and about ¼ inch over top. Stir. Place inner pot on top of chicken. Set pot to cook on high pressure for 8 minutes. Remove rack with chicken. Cut into bite-sized chunks. Optional: In a baking dish, add chicken to macaroni, mix well and pop into oven to brown top. Hi–I’m a little bit confused. Are you suggesting to place the steamer rack directly on the head conductor (without the inner pot), then place the inner pot on top of the chicken? If I did that, my lid certainly would not close. If that’s not what you mean, could you clarify the instructions? I’m new to the IP, so there might be something that I’m missing. Thanks! Hi Leslie. You place the steamer rack in the inner pot. Sorry if there was any confusion.